What would the slot industry do without fruit? From the early days they have played an important part when it comes to the choosing of symbols for games. That of course led to the machines being known as fruit machines and they still have an important role now. 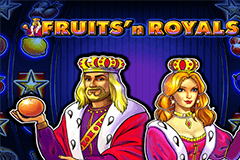 The playing cards may have overtaken them as the most popular lower value symbols in games, but sometimes they get their own starring role and that’s definitely the case in Novomatic’s ‘Fruits n Royals’ slot game. The fruit symbols don’t have all of the spotlight to themselves though. As you might guess from the title of this game, there’s also some royalty involved here. It’s a strange mix of royalty and fruit unless you’re a history buff and remember the monarch William of Orange! This is a five-reel game that has a total of just the five paylines for you to try and get some valuable winning combinations on. Those five paylines are a fixed amount so no need to worry deciding how many to play on each spin of the reels. It’s up to you to decide your stake, simply work out a financial budget and don’t gamble anything you can’t afford to lose. It’s not an expensive game though so there shouldn’t be any problems here. With there being so many fruit symbols in the game this means you are guaranteed a bright and cheerful looking game. The accompanying soundtrack isn’t off-putting either and adds to the enjoyment of playing the game. Symbols are cherries, plums, lemons and oranges on the fruit side of things. Then we get the King, Queen, crowns and stars. Keep your eyes out for the crown symbol as this is the highest paying one in the game with five on an active payline giving you a reward of 10000x your line bet. The King and Queen both pay 1000x if five arrive on an active payline. As usual the cherries are the lowest paying symbol but you do only need two of them on an active payline to get a win. Winning combinations are paid out from left to right but not so for one particular symbol. The star is the scatter symbol in this game and pays out when at least three of them appear anywhere on the reels. Get five of them and that pays a 500x multiplier. To find out what all the winning combinations pay simply access the paytable. That has all the information you need to know in this respect. Also have some free games, this may not be a complex game but it’s always good to seeing the game in action before starting to put real cash in. The game is easy to operate with all the control buttons down the bottom of the screen underneath the reels. If you want some time away from the screen utilize the autoplay button which is directly above the Start button in the bottom right hand corner of the screen so you can’t miss it. There’s no wild symbol or any free spins game in this slot. That might put a few you off playing this but it’s still very much a game that is worth giving a go. There is one chance to boost your wins and that’s via the Gamble Feature but be careful with this. When you get a winning combination you can double that by correctly guessing the colour of the next card drawn. Get it wrong though and you lose your win. You can go through the guessing game five times if your luck is really in. It’s not compulsory to go for the gamble and I wouldn’t go anywhere near it with a big win because it’s just so risky. Try it with a real pack of playing cards and see how difficult it’ll be to hang onto your winnings with one correct guess after another. The fact there are no bonus games or wild symbols might discourage some but this is definitely worth playing. There are some good wins to be had here and it’s a bit of a change not having to chase free spins all the time. Be careful with the gamble feature though, even if it is the nearest you’ll get to a bonus game here.